From the overflowing window boxes of Bay Ridge to the patchwork of urban farms in East New York, gardening in Brooklyn means tradition, therapy, discipline, beauty, and can-do resilience. But when the second spring since Sandy came this year, many gardeners in coastal Brooklyn did not see the buds and blooms they were used to. Trees and other plants they had hoped would recover from saltwater inundation remained brown and lifeless. The message was clear: Not only would coastal communities have to rebuild their homes and businesses, they would have to restore their soils, trees, and green spaces as well. With an eye toward a more resilient future, these gardeners are asking: How do we plant smarter and stronger? The effects of the superstorm certainly linger, but home and community gardeners on Brooklyn’s floodplains are proudly restoring deep roots and resilient gardens. 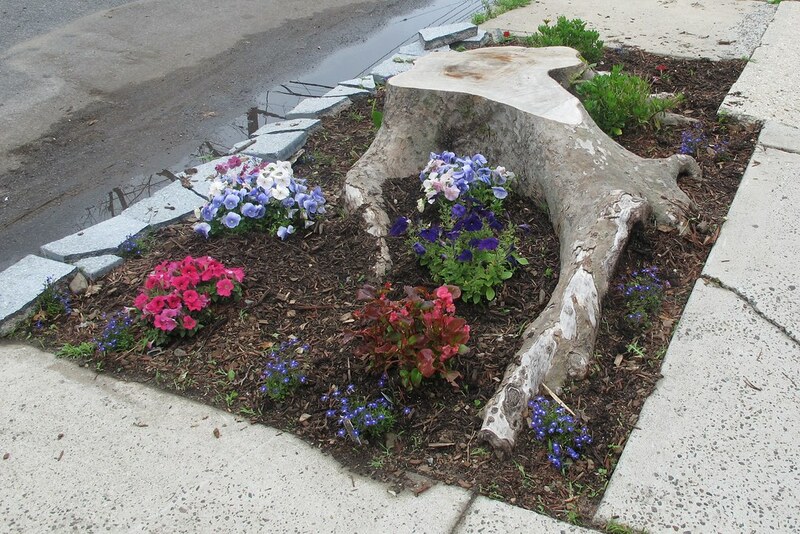 Neighbors united in the spirit of greening will urge spring to bloom more brightly next year. Claudia Navas is the project coordinator for the NYC Compost Project hosted by Brooklyn Botanic Garden. An experienced farmer, she feels most grounded and empowered with her hands in the soil. Despite the loss of many mature London plane trees, gardeners on a block in Canarsie find the spirit to bloom. Photo by Nina Browne.